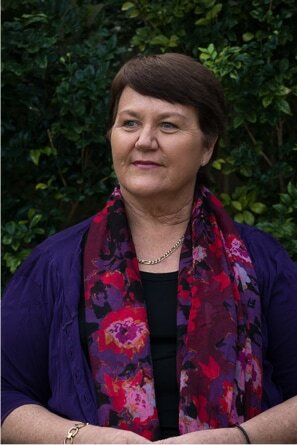 Living with cancer made me realise the importance of having positive dreams and goals. Travel, and travel planning, was a great distraction for my mind from the everyday challenges of medical appointments, preparing healthy food, and ruminating about my uncertain future. For many years I have dreamt of visiting Hawaii. My imagination conjured up tropical beaches lined with palm trees, people surfing in teal blue water, and the dulcet tones of a ukulele. Many years, and numerous travelling adventures later, I recently realised my dream of visiting Hawaii, and much to my surprise, I discovered that it offers so much more than this limited stereotype. Julie Baker is a brilliant creator of unique travel experiences and founder of Journeys of the Spirit. Together we embarked on a research trip to discover the mystical essence of Hawaii, in preparation for a spiritual retreat that I will be guiding in 2018. Here I was, living my dream. Two Australians in a far away land, driving on the “opposite side of the road,” with no particular plan. Over many years, Julie has created countless exceptional journeys for her travel guides to share with people seeking more than ‘just an ordinary holiday’. I felt like an apprentice, watching the master execute her craft. It was very clear that Julie was seeking something that could not be seen with the eyes, but instead felt by the heart, and experienced with the soul. I tuned in to her unique skill of discovering the unseen forces which make a sacred place special. After settling into our accommodation in Hilo on the Big Island, we were brimming with excitement and anticipation as we followed the precise instructions given to us, to meet with a Kahuna (Hawaiian Priestess) at her home nestled in the middle of a well-manicured tropical garden. The highlight was sitting and talking with her under the ‘Miracle Tree’ (a massive and impressive Banyan tree). The Kahuna was delightful and I was fascinated to hear that she could trace her ancestors back 75 generations. She carried her mantle of spiritual healer and psychic with grace and dignity, giving us both a personal reading and invaluable guidance. The following day we felt the beckoning of Pele, the goddess of fire, lightning, wind and volcanoes who, we were told, lives in the volcano and is the power that created the Hawaiian Islands. Julie and I were spellbound by the beauty and power of the land surrounding Kilauea volcano. The scenery varied from lush green forest to black desolate lava flows, giving the impression of being on another planet. The sunset was stunning. We watched the sky transform to red as the sun sank behind a hill, then as we turned to look at the smoke billowing from the crater, we discovered that it had magically transformed into a reflection of the sky. The most magnificent red fire, spewing from the earth with power that must be felt to be believed. The night air was cold, in total contrast to the warmth that emanated from the gaping hole in the earth. We were experiencing the earth alive and breathing fire. I closed my eyes and imprinted this image into my mind. A tremendous feeling of power and life, and paradoxically, an awareness of sacredness and vulnerability. A magic moment and gift that I will never forget. Arriving on Kawaii by plane, left us feeling discombobulated. We felt that we were in the wrong place, so we pulled the car over to the sidewalk, and instead, walked along the street, looking for somewhere to sit and gather our thoughts. Julie was scanning for a coffee shop and I was looking for a “sign” or guidance. I spotted a stairway leading up to a new age shop. It wasn’t exactly what we were looking for but the woman kindly pointed us in the direction of Jeannie, who leads spiritual retreats on the island of Kauai. Now here we go. Back on-track. Meeting Jeannie was like a reunion of old friends. There was much chatter, laughter and a very kind invitation to join her the following day to explore some sacred places on the island. Julie and I were thrilled. It was like we were destined to meet each other and share this special time. Deep, life-long friendships were formed. Plans are now well underway to share this magic with a small group of ten adventuresome people who feel the spirit of Hawaii calling them. 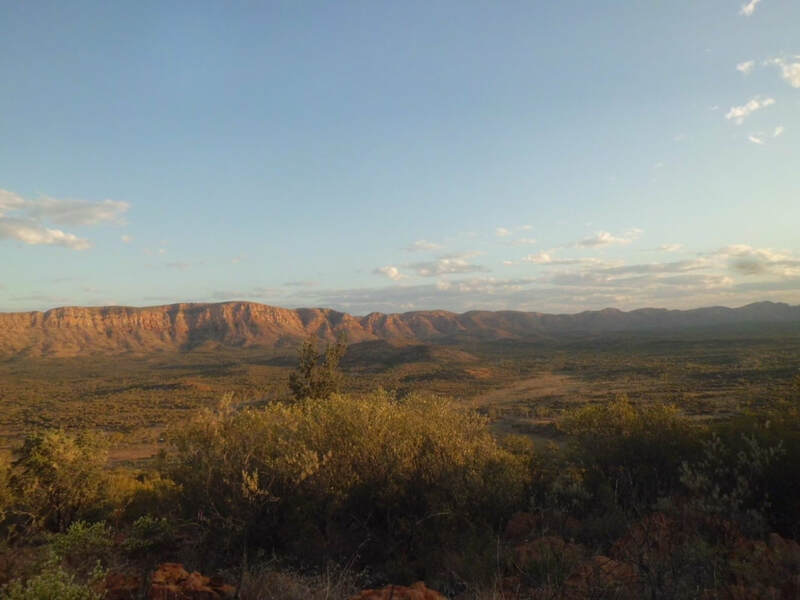 If your spirit is guiding you to connect with this ancient land on a deeper level, please contact Julie at www.journeysofthespirit.com.au and register your interest. I am looking forward to meeting with and guiding kindred spirits to this very special land. Nature Deficit Disorder refers to a hypothesis by Richard Louv in his 2005 book ‘Last Child in the Woods’ – that human beings, especially children, are spending less time outdoors resulting in a wide range of behavioural problems. I was told twenty seven years ago when I was first diagnosed with secondary cancer to get back as close as I could to nature if I wanted to heal. The theory was that the further people get away from the way nature intended humans to live – the more at dis-ease people would become. This advice included eating the way that nature intended – S L O W – season, local, organic and whole. The more times food is processed – the further away from nature it becomes. Our bodies just aren’t evolved enough to process all this ‘processed food’. If fact, I hesitate ever calling it food because most products in the supermarket now are not really food – they are stomach fillers – just look at the labels to see how many chemicals, colours and additives are included. Many manufactures have no idea about nutrition and their bottom line is profits – not your health. It is not their fault that we get sick from eating this substance – we live in a free country – we have choices – but I believe it gets back to awareness and self responsibility on our part to make healthy choices and respect our bodies. Over the years I have seen people protest about the terrible conditions that ‘battery hens’ and other animals are forced to live – and I agree with them. Under artificial lights, pumped with antibiotics, never getting to scratch the ground, stressed and starting to attack each other – is this sounding familiar to the stressed and sterile life we also live? Living under artificial lights, synthetic carpet on the floor, furniture which off-gasses chemicals into our homes – never getting our hands dirty – using anti-bacterial sprays and gels to kill the germs – what about our immune system? Also, there is so much fear of the sun these days that people prefer to stay ‘locked up’ inside instead of enjoying our beautiful climate. Many people now have a deficiency in vitamin D3, which is essential to many processes of our body – but don’t worry - there is a pill to fix this up! What about the sun – it gives us life and people throughout time have worshipped the sun for its powerful light and fertility. The Greeks, Egyptians, Mayans, Aztecs, and modern day Christians have all considered the sun sacred in one way or another – but now we are all conditioned to live in fear of it. Don’t get me wrong – I am not saying to go outside and get your skin burnt – there are sensible limits we all need to live by to survive. Our bodies and mind were not intended to be bombarded by noise and electrical equipment and stimulus all the time. How many people now cannot sit in their car or home without turning the TV or Radio on? We are on sensory overload and our bodies are trying to tell us something! Years ago, I was very fortunate to assist Drs Ian and Ruth Gawler with their Meditation in the Desert Retreat – 1 ½ hours out from Alice Springs. (Read more about this in Chapter 13 of My Answer to Cancer.) What I realised for me was that this was a time when I could ‘reset my master switch’ – by getting back in touch with life – the way nature intended. There is a button on your mobile phone – when you have interfered with all the settings and it doesn’t work properly – you simply press the ‘reset’ button and the phone reverts back to the factory settings. This retreat helped me get back to my omni-potential (my factory settings). We were sleeping in swags – on the ground (on an ancient riverbed) and under the stars – wow! This was a first for me and I’m sorry it took my so long to have this experience. In a book called Earthing, authors Clinton Ober, Martin Zucker and Dr. Stephen T. Sinatra put forth a bold proposal that body-to-earth contact has the power to directly impact our health. At the heart of their theory is a central physics-based relationship. “Since the advent of shoes, houses, flooring, and elevated beds, we’ve lost our contact with the earth and its inherent electrical field. In discarding (or minimizing) this physical connection, we’re forgoing natural healing benefits that previously played a significant role in our physiological functioning. The body, when grounded in the earth, returns to its natural electrical homeostasis as part of the living electrical matrix.” It’s an intriguing theory with, as yet, little attention. We ate organic vegan food for ten days – clean food prepared lovingly by the cook and his volunteers. We meditated several hours a day in silence – listening to nature – the wind, birds and buzz of the flies. We talked around a campfire at night, listening to stories and sharing with like-minded people – fabulous. And on the last two and a half days were privileged to sit with the local indigenous elders who shared with us their ways of living. Their ancestors had survived in this part of the country for 60,000 years and looked after the land. I could not help but reflect on what has been done to our beautiful country with chemicals and imported animals in the last 200 years. I know we are called the Human Race – but what are we racing for? Why don’t we take time to slow down? Slow down and smell the roses – in the sunshine, the wind blowing on our faces sharing our time on this earth with the people we love. Remembering and re-connecting to ourselves and living our lives in harmony with the Laws of Nature. I am often asked, “How did you recover from terminal cancer?” and my answer is, “There wasn’t one thing that saved me, there were many.” However, opening my mind to new possibilities is certainly right up there at the top of the list. Over the years, I have discovered that there are ‘many pathways up a mountain’ and finding the right one can sometimes be confusing and disheartening. This was the first book to find me on my life-changing quest. Excitement filled me as I read and relished it’s pages. I discovered that there are many more choices in overcoming cancer that I was originally aware of. I was introduced to simple lifestyle strategies including; meditation, nutrition, finding purpose, and power of the mind. On reflection, I was unknowingly building strong and sturdy foundations for my future health. At that time, I had no idea that within five years, Ian would be training me to facilitate a ‘Cancer, Healing and Wellbeing Course’ based on this very book! Facilitating this program over the last two decades has fueled my life with purpose. This book unexpectedly came into my possession via a friend of a friend. The synchronicity of its arrival could not have been more perfect. At the time, I was experiencing a barrage of unhelpful thoughts, terrorising me and creating a tidal wave of fear. Through this book, my sub-conscious mind was gently nudged opened to the possibility that I could change my thoughts and ultimately heal my body and my life. A major breakthrough! 3. Love, Medicine and Miracles - Bernie Siegel, M.D. This book almost jumped off the shelf and landed into my hands as I perused the library shelves. It was as though a strong magnet was drawing me to the wisdom within these pages. Wow! My mind was spinning fast and I could feel a sense of excitement and empowerment rising within me, as the information poured towards me. Here was a doctor explaining the importance of the mind in the recovery from disease and I felt as though I had discovered a treasure chest of ‘hidden secrets’. My mind was convinced of it’s own ability to heal. With every page, my future became brighter and brighter. An intriguing story of a young woman’s near death experience. Life and death come hand in hand - you can’t have life without death. I facilitate a Woman’s Healing Circle where the fear of death is often discussed and I am astounded at the response this book receives. Many of the women, facing their own mortality say, “Since reading this book, I am no longer afraid of dying.” There is so much power in this book. It illuminates a pathway to peace and healing. Even in perfect health, this book is life changer and an absolute must read. I often sign my own book, ‘My Answer to Cancer’ with the words, ‘Just another concept for you.’ I hope that ‘My Answer to Cancer’ also becomes a signpost for others to find courage, and believe in themselves, to find their own unique pathway to health and happiness. I invite you to please leave a comment below, with the title and author of books that have transformed your life – it may just be the very signpost that someone else is searching for! ​I cannot recall the first time I heard about Findhorn, however the seed was planted deep within the subconscious part of my mind. Little did I know that this seed would sprout at precisely the right time, during my fervent search for healing, to guide me to the pathway to this spiritual community. I was going through an extremely difficult time in my life, and I felt emotionally lost and spiritually alone. My priorities were to develop trust, resolve grief and find a firm foundation to rebuild my shattered life. I vividly remember sitting bolt upright at two o’clock one cold winter’s morning with a powerful thought bursting through my mind - “I’m going to go to Findhorn.” My body was buzzing and I had no idea where the thought had come from, however there was a deep sense of mounting excitement that I would experience a very special place. Reluctantly, I extracted myself from the warm sheets and comfortable bed to search the internet for directions to this place that was calling me, and also to find out what on earth this ‘Findhorn’ place was all about. One week after arriving, Findhorn completely turned my life around. For me, that was a miracle in itself. Over the decades, this mystical place has beckoned many who were in need of healing, and attracted to the light that pulsates from its heart. Each person who visits this intriguing place has their own unique experience. Perfectly suited to their aspirations, whether that is a quest for healing, or finding deeper meaning in life. The seven days of ‘Experience Week’ is the portal to enter this mystical place. It is a week designed specifically to introduce people gently into the philosophy of the eco-village and give a taste of the many aspects of community life it has to offer. Community could be interpreted as ‘common-unity,’ - a place where everyone joins together, without distinction of gender, colour or nationality. I was in a group of twenty four, consisting of people from Australia, Africa, Spain, Wales, Switzerland, Italy, France and the United Kingdom. By the end of the week, we were a tight knit family. A universal family, the way it should be. Even though we came from all walks of life, and different backgrounds, we were all searching for something deeper, and knew that there was far more to life than the shallow lure that consumerism and capitalism offers. 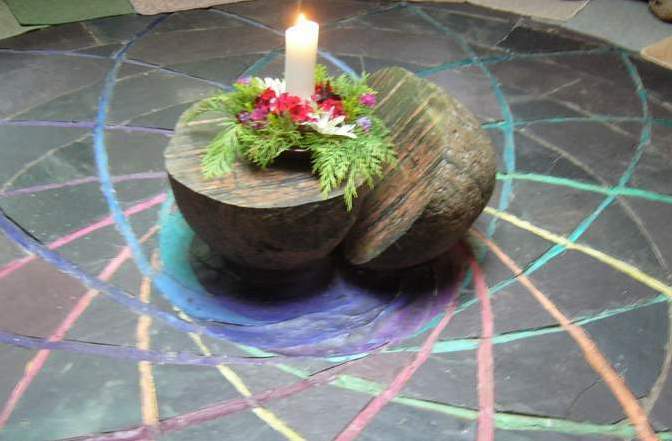 What I discovered during my time at Findhorn was that I had been searching for peace and healing in all of the wrong places. Seeking fulfilment through other people and attaining possessions to give myself a false sense of security was not the answer for me. Findhorn allowed me unfold my soul and re-connect to my inner self. Something I had yearned for a long time, but did not have the knowledge, skills or courage to accomplish. And here I made this discovery, in this remote place, half way around the world from my home in Australia. I have often wondered what woke me up that cold winters night and prompted me to search out Findhorn. Was it intuition? Or was I awakened by my spiritual guides? Perhaps it was just good luck or pure coincidence? I believe that it was my intuition – the unseen force that is skilfully guiding me through life and to the experiences I need to grow and become more aware. Do you listen and act on the prompts you get from your intuition? Have you ever had a ‘gut’ feeling that goes against all logic and then decide to follow logic, only to regret it afterwards when everything goes ‘pear shaped’? Imagine how different our world would be if we all learnt to trust our intuition and allow it to guide us to places and experiences we need to become the best version of ourselves. Personal growth is about taking risks and breaking down the barriers we have built around ourselves, falsely believing that we are safe, hiding behind them. Trust your intuition and give it a chance to guide you to a better place. If you would like to know more details about my Findhorn Experience, the full story of my adventures are in chapters eight and nine of my memoir ‘My Answer to Cancer’. Is cancer bad luck or an invitation to change? ​If someone had asked me this question twenty seven years ago I would have thought they were mad. I remember sitting in a cancer support group when I was first diagnosed with metastatic melanoma. I was discussing the difficulties I was encountering with this life-threatening diagnoses, when a woman look straight at me and stated: “Having cancer is the best thing that has ever happened to me.” I thought, “You have to be crazy lady! I could not comprehend this statement from her. How could anyone even suggest that cancer is a blessing?” Today I understand her wisdom. One of the important things I learned on my journey to the present is how to look after myself. We often put everyone and everything else before our own needs and yet there is a little part of us that silently questions “When is it MY time?” In our society, putting oneself first can be judged as selfish. However, investment in our basic needs is a vital element in maintaining health. Cancer evokes many emotions and one of those can be regret. Regretting missed opportunities. Regretting not pursuing dreams. Regretting not taking control of the direction of our lives. It was important to me not to die with regrets so I had to do something about it. My time was decreed limited by the medics. I had to find ways to accelerate my desire to be fulfilled and satisfied with the decisions I made in life. Being diagnosed with cancer was like placing a magnifying glass over my whole life. Nothing was left unexplored and I made rapid changes in response to the news that I only had two months to two years to live. My questioning of myself began. Where do I start to make changes? How do I achieve them? How do I find the resources to support me through this? These were only a few of the quandaries I contemplated. So the invitation to change my diet was accepted easily without any hesitation. My body responded quickly to being fueled with optimum nutrition, and rewarded me with more energy and a very deep sense of well-being. This is a choice that everyone, in sickness and health, makes many times in a day. It is important to be aware of consequences, remembering the quote ‘one man’s meat is another man’s poison’, so listen to your body and respond appropriately. Look at your food and ask the question “Is this food life-giving or life-taking”. You will intuitively know the answer. Fortunately I realised what I had been doing, and I knew I had to find a new way of dealing with stress and anxiety. After much searching, I discovered that meditation was the key for me to unlock the vault deep in my mind and access the incredible power within. This allowed me to make helpful, insightful choices and create healthy, positive responses to stressful situations which confronted me. One of my big aha moments was when I realised that we exist in a world of duality: ying-yang, hot-cold, up-down, night-day, war-peace and fear-love. I realised that I had subconsciously focused my mind on fear which resulted in me living a restricted life. Cancer gave me the invitation to change this perception. I chose to re-train my mind to look for the love and peace in situations which led me to a sense of empowerment and choice. My life had to change drastically and I was the only one with the control to do so. The driving engine was my mind. I decided then and there that my life was going to be an adventure and filled with wonderful experiences – whatever happened to me. I programmed my mind to seek constructive and alternative ways of perceiving and responding to uncomfortable situations. 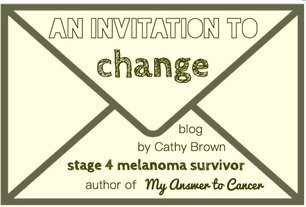 So is cancer an invitation to change? It certainly was for me and can be for anyone else who decides to alter their perception of disease. It is most certainly something I would not wish upon anyone, but what if disease is simply a messenger who is trying to get your attention. If not acknowledged, it knocks louder and louder with the message that something must change! That something in the body, mind or emotions is out of balance. It may be bringing you an awareness of toxic food, thoughts, emotions or relationships which need to be addressed, and have been ignored or buried far too long. Are you living the life you want and deserve? If not, is there anything you can change in your life before life invites you to change? As it turns out for me, I now consider cancer to be one of the biggest blessings in my life, and perhaps to others, I’m just that ‘crazy lady’ that I met twenty seven years ago.